I made the mistake (it really wasn't a mistake--I just like to tease him) of making scratch biscuits for my husband soon after we first married. Since then, he refuses to eat store bought canned biscuits at home. He will happily eat them at someone else's house, but at our house, biscuits have to be homemade. The taste and texture is so much better that I really don't mind. These are great with butter and honey, a dab or jelly or jam, syrup, or gravy. They also make good breakfast sandwiches with a slice of ham, cheese, and a well-done egg, or breakfast sausage patty. Measure the dry ingredients into a medium mixing bowl. In a glass, liquid measuring cup, measure ¼ cup of oil. Into the same measuring cup, over the oil, pour in milk to the 1 cup mark (mixture will bubble). Pour all at once into the dry ingredients. Using a fork, stir until dough follows fork, then stir 10 more times. Flour your hands, and knead dough ten times. Roll or pat dough onto a cutting board or clean counter. Cut into squares or use a floured glass to cut round biscuits. Place in pan according to preference mentioned below. Bake 15 to 20 minutes, until light golden brown. If you are in a hurry, you do not have to roll the dough. Pat it out and tear off biscuit size pieces and put them into the pan. If you want the biscuits to be crispy, butter or oil the pan. Otherwise, just place then in the pan. If you prefer the sides to be crusty, place the biscuits 2" apart on the pan. This recipe also works great as dumplings. Break off pieces of the dough and drop into boiling soup. Make sure the bread dough completely submerges in the liquid. Turn the soup down to simmer, cover and cook for 20 minutes. Watch carefully. If the soup boils over, remove the lid, turn the heat down, and then recover. 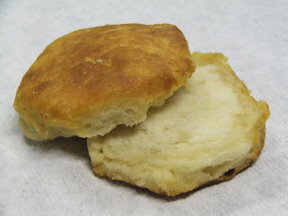 Do you prefer homemade scratch biscuits?